Babyetch® allows you to hold your baby before birth. 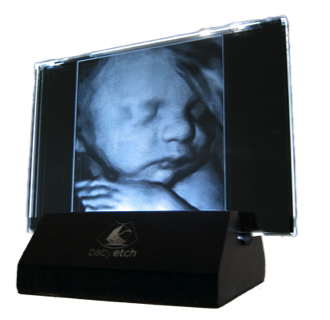 Simply submit your baby’s ultrasound image and it will be carefully etched it into a laser-cut crystal. Dim the lights and cherish every contour of your baby’s face as it beautifully glows. Envivo™ products make the perfect baby shower gift - an elegant true-to-life keepsake to be cherished for years to come. You must use coupon code BE1001_PA when ordering. Available in Envivo Crystal (shown right), Envivo Marble, the Precioso 3D, and the Precioso Key-Chain. Be sure to see samples in the waiting area of our facility - exclusively at InnerView Ultrasound.